It's a fact that has been milked to death when mentioning the renowned animation studio, but one that does at least hold some merit - Dreamworks like their sequels. Evolving even their smallest of films (How To Train Your Dragon, anyone?) into gargantuan franchises is their specialty, and one that for the most part comes off as a huge cash grab even if the money generating sequels share a level of high quality. It isn't rare, however, to see a fresh product from the studio's pipeline, and Rise of the Guardians is here to exemplify this - what it can't exemplify, however, is any form of originality for the genre. Jack Frost (Chris Pine) rises from a strange slumber inside a cold lake with no memory of his existence or purpose, only being told his name by the godlike entity dubbed 'The Man in the Moon'. As the years pass, Frost utilizes his abilities to manipulate snow and ice to bring joy to children and himself, albeit in a rebellious and careless fashion. When the sinister boogeyman known as Pitch Black (Jude Law) emerges from his own slumber to seek revenge on Guardians North (Alec Baldwin), Bunnymund (Hugh Jackman), Tooth (Isla Fisher) and Sandman, Frost is chosen to fulfill his destiny as the next Guardian, which in turn will lead him on a journey to not only save the children of the world but to discover the one thing he has always wanted to know - his own self. 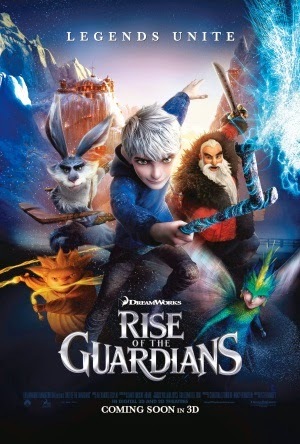 Rise of the Guardians, like any film by Dreamworks, is richly animated, albeit this time around things seem a lot less colourful which actually works in conjunction with the somewhat bleak narrative structure. The overall aesthetic design, while definitely not matching the terrifying motion capturing of Zemeckis, adopts a more realistic approach over a cartoonish and vibrant appearance, which is also something that fits the story nicely and makes the film less reliant on endless visual gags. Where Rise of the Guardians loses it's footing is with the overall plot and some of the characters, which are both so by the numbers that it feels very little effort was put into developing any sort of original plot with the somewhat unique premise at hand. Virtually nothing about the story is inventive, and the villain is completely ridiculous - Jude Law's voice acting attempts to capture some overall sinister vibe, but just comes off as forced and absurd. The plot is riddled with cheesy dialogue and forced emotional scenes, the only saving grace of these being the likeable main protagonists. Frost is rendered to be somewhat unlikeable, but has a certain charm and his lust for his own past raises some interesting if barely explored inner conflict. The other Guardians, namely the Easter Bunny and Santa, provide much of the film's comedy and help to forward the narrative, but even they feel half baked at times. Everything is resolved with a lifeless and predictable culminating battle, and the conclusion to this film raises absolutely no surprises whatsoever. I'm not trying to pan it simply for being unoriginal, for it's a decent animated flick - the jokes work, the voice acting across the board is excellent (bar Law mainly) and it goes without saying that it's visually pleasing. But the inventive premise has been squandered on a story so bland and so irritatingly predictable that the film feels like a missed opportunity. Not bad, but certainly not great.